Timothy Chooi | Dispeker Artists, Inc.
Canadian violinist Timothy Chooi is regarded as one of Canada’s most promising and exciting young artists. 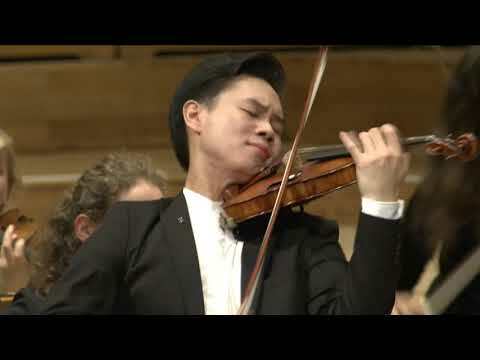 Described as “the miracle” by Montreal’s La Presse, Chooi won a top medalist at the Michael Hill International Violin Competition in New Zealand. He won the Verbier Festival Academy’s Yves Paternot Award, the Academy’s highest honor bestowed on the most accomplished Verbier Academy musician, and most recently was awarded first prize in the 2018 Joseph Joachim Violin Competition Hanover. 2018-19 season highlights include performances of Mendelssohn, Schubert, Mozart, and Piazzolla at the Montreal Symphony Classic Spree, a Morning Musicales Recital at the Philadelphia Ethical Society, a performance at Impromptu Classical Concerts at St. Paul’s Episcopal Church in Key West. and soloist performances of Tchaikovsky’s Violin Concerto with the North State Symphony, Korngold’s Violin Concerto with the Regina Symphony Orchestra, Bruch’s Violin Concerto No. 1 in G minor, Op. 26 with the Allentown Symphony Orchestra, and Heinz Moehn’s Violin Concerto with the Saskatoon Symphony Orchestra. "He won over the audience with grace and finesses rather than flash, Chooi truly played with the orchestra, not simply taking the spotlight out front. In moments where he was not playing, he closed his eyes and swayed in appreciation. He gave the impression he truly enjoyed being part of this historic night."